More details are available for the 1977 cult post-apocalyptic thriller nuking Blu-ray in July. 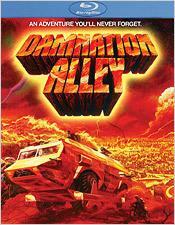 As previously reported, Shout Factory will release 'Damnation Alley' starring Jan-Michael Vincent, George Peppard, and a young Jackie Earle Haley on Blu-ray on July 12. Specs still have yet to be revealed, but supplements include audio commentary with producer Paul Maslansky, Survival Run, Road to Hell, Landmaster Tales, a theatrical trailer and a TV spot. You can find the latest specs for 'Damnation Alley' linked from our Blu-ray Release Schedule, where it is indexed under July 12.